Floria Axani was born on March 14, 1885 in the village of Mahala, the eldest of five children in the Tanas and Anita Axani family. As a child he attended the village school and completed grade six. For a few years he worked for the boyars (landlords) but the exciting news about land in Canada convinced him to leave his home at eighteen years of age and emigrate to Canada. Once in the New World he worked in the eastern provinces but eventually he arrived in southern Alberta where he worked in the mines with friends from back home. Labor was unbearable drudgery in hazardous and unsanitary conditions. Floria often worked on his knees with pick and shovel in cramped quarters where it was cold and wet. For this he was to pay dearly later on. When he reached middle age he suffered at times excruciating pains so great that he spent one summer in bed unable to get up and enjoy the outdoors. To cure himself or at least to alleviate his suffering, Floria visited doctors but in the end he resorted to old-fashioned home remedies. Nothing actually helped him because he was chronically ill till the day he died. To return to his mining days, Floria worked till he accumulated enough money to start another career. He quit mining, journeyed north to Boian and settled on a homestead. There he built a small house, then began the big task of clearing the land of trees and rocks. In 1913 Floria married Domnica Yurko, daughter of Nazarie and Acsenia Yurko. His bride was born in Boian, Bucovina in 1895 and was only four years old when she came to Canada with her parents. The young newlyweds settled in their new home and began farming together. Like other pioneers they bought a pair of oxen to break the prairie and later purchased horses. At this time Floria would walk to Edmonton to purchase necessary items and return on foot, spending a week on the trail. When Floria had a fine team of horses and a wagon, their mode of travel had improved. However, one day Floria and Domnica were on their way home and the young driver was showing off a bit and the wagon overturned in a ditch causing Domnica to break her wrist. The family grew in numbers and with the outbreak of W.W.II, three of the Axani boys enlisted and the younger ones had to help on the farm. Although there was more help, Floria’s rheumatism grew unbearable, so he sought relief in trying any new remedy that came on the market. He tried lotions, potions, salves and liniments. Once he put on a salve that caused a horrible rash to appear on his skin. This, too, did not help much! He even travelled to Edmonton where he was given “blood letting” to be followed by a good Turkish bath. At another time Floria purchased a pet leech which he kept in a jar with water. At regular intervals he would take his leech, put it on his legs to extract some of the “bad blood” and relieve him of pain. When this was over he resorted to herbs, onions, garlic, and mud plasters. Unfortunately, other than temporary relief, the pain remained. More progress on the farm! Horse power was replaced by tractor power when a Twin City 1530 tractor was purchased. Other necessary implements were also bought. The older boys could not be kept away from using this machinery. It was more interesting and faster than driving horses. For music in the family, the Axanis had a Victrola gramophone that served them well for years but in 1940 Floria invested in a radio. What excitement in the home – music, news, programs of all kinds for a hungry audience! The Axanis liked to visit and enjoyed entertaining. They had weddings, hrams, (local church patron saint’s day), baptismal parties, anniversary parties and sometimes any excuse ended up in a party. These feasts sometimes lasted two days. One event in Floria’s life must be related. He and Tom Kokotailo were close friends but by 1944 neither one had a brother in Canada so they decided to become “blood brothers”. A good deal of planning went into this affair with the joyful day finally arriving. The day began with a short religious service during which time each had to pledge certain vows. Then they retired to the Axani residence where a large feast was held followed by singing, story telling and dancing. To the end of their lives these two men greeted each other as brothers whenever they met. In later years the most memorable occasions in the Axani household were at Christmas particularly, and Easter. On these occasions the sons and daughters and their families would arrive at the farm. With what joy Floria and Domnica would welcome them all! There was food and beverages, singing, exchanging of news and playing games for younger members. This prac¬tice was carried on for many years even after Floria’s and Domnica’s health began to deteriorate. 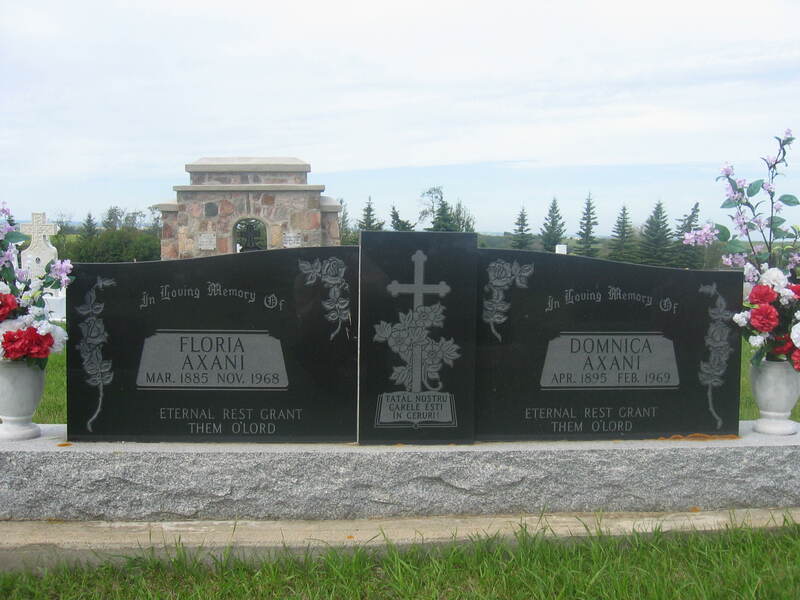 Floria died on November 29, 1968 at age 83 and Domnica died shortly after on February 10,1969 at age 74. They are both buried in St. Mary’s Romanian Orthodox church graveyard at Boian, 3 miles from the homeplace but half-way around the world from their birthplace in Romania. Mike, the eldest was born in 1913. After completing grade eight he helped his father on the farm. To increase his knowledge of farm machinery, he attended a trade school in Edmonton. At twenty-two, he married Mary Darda of Ispas and began farming together. In the fall he would also operate a threshing machine and in the winter he operated a lumber mill. In 1979 Mike passed away. His wife Mary continues to live on the farm. Bill, also continued farming after leaving school. He married Katie Hantiuk and the young couple farmed for a few years. They then moved to Edmonton where Bill got a job at Superior Sash and Supply, where he worked till 1980 when he retired. Bill and Katie raised a family of two girls and three boys. Sarah, the eldest daughter, became mama’s helper at a very young age. Once she completed public school she stayed home to help. In 1936 she married Metro Moroz and they farmed for thirty-nine years. They had four children, two boys and two girls. Metro passed away in 1971 and Sarah moved to Two Hills. Later she married Paul Kisilevich and they both enjoy a happy retirement. John Axani also worked on the farm, after completing public school. When World War II broke out he joined the army and served in various areas, later transferring to the airforce where he learned basic electronics. While stationed in Nova Scotia he met and married Irene Cross. At the end of the war he returned and eventually settled at Bonnyville where he owns and operates an electronics business. 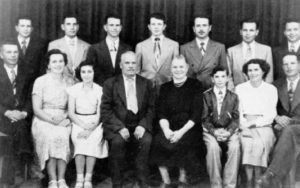 John and Irene have six boys and one girl. Ted followed in his siblings’ footsteps, completing public school then working on the farm. In 1942 he joined the R.C.A.F. and served till March 1946. In Montreal he married Eunice O’Connor and the couple was blessed with three sons. This marriage ended in divorce. He worked for S. Kresge Co. for thirty-three years. Then he retired in Calgary where he and his wife Laura reside. Ted spends his free time painting and golfing. Stephen was the middle child. He completed public school, worked on the farm and in 1943 joined the R.C.A.F. When discharged in 1946 he decided to go into woodworking. He formed his own company Superior Sash and Supply in 1952 and operated it successfully till 1977. Steve married Doreen Safronovich and together they raised a family of three, Monica, Ramona and Eugene. Anne, the second daughter, also attended the local school. While still a teenager she did most of the housework as her mother was frequently ill. In 1948 she married Nick Gorda of Desjarlais and they made their home on the Gorda place. They had a family of five, two girls and three boys, including a set of twins. Nick and Anne have now retired in Willingdon where Anne enjoys gardening and housework. After completing public school at Boian, George went on to Willingdon High School. There he completed Grade XII successfully and then went out working. He worked at various jobs but ended up at 7 C.F.S.D. Lancaster Park near Edmonton where he still works. In 1954 he married Hazel Zaptichny of Chipman. They have a son Barry and a daughter Bonnie. Con finished grade nine at Boian and farmed with his dad for a time. In 1954 he married Marion Fedorak and moved to Bonnyville. For a time he worked with his brothers at the Tropicana Club in Grand Centre. In 1966 he opened his own upholstering business which he operated till his death in 1984. Con and Marion raised a family of five boys and two girls. When Metro completed school at Boian he worked on the farm then became a trucker. He married Shirley N. Hutscal. The couple moved to Edmonton and Metro secured a job at Superior Sash and Supply where he still works. This couple has three daughters. Art Axani attended Boian School then proceeded to high school at Willingdon. Once he graduated he went to Bonnyville where he apprenticed in electronics and electricity in his brother John’s shop. In 1960 he married Rosemarie Nettleton and shortly after joined the civil service at the Cold Lake airbase. In time he became a professional Aircraft Crash Rescue firefighter. In that capacity he served in various places in Western Canada working his way up, finally ending up in Edmonton as an Emergency Service Officer. Art and Rosemarie have a son Richard and a daughter Rhonda. Nestor, the youngest son, attended the Boian school and then went to Willingdon. On leaving school he remained on the farm where he still resides. Eleanor, the thirteenth child, but not at all unlucky, completed Willingdon High School and shortly after married George Lutzak of Hairy Hill. They farm in the area and have two sons. Grigorie? (Florea) Acsani birth record. Grigorie was born on Feb.27, 1885. Father – Tanasi Acsani. Mother – Anna Damian. Aftanasi (Tanasie) Acsani and Anna Damian marriage record. Oct.24, 1882. Aftanasi, son of Ioan Acsani and Casandra Bujenita married Anna, daughter of Toader Damian and Maria Besplitnei. Both were 22 years old. Aftanasie was born on 18 Jan. 1860. Father – Ioan, son of Georgii Acsani. Mother – Sanda. Ioan Acsani and Sanda Sinita marriage record. Jan.25, 1853. Ioan, son of Georgie Acsani married Sanda, widow after Pavel Sinita. Ioan was 27 and Sanda 38 years old.